Well, I got my computer a few days ago, so I am now officially back. 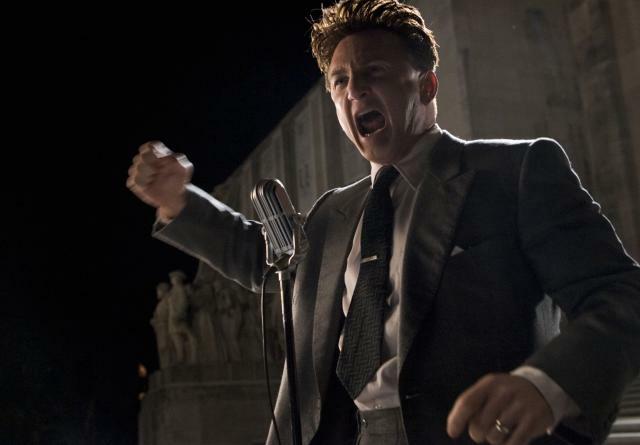 I had hoped to have my first post back be capsules for all the remaining films I saw at the Toronto festival, but I have come to realize that if I do that, I’ll probably never start up again. And I do want to get into the routine of posting regularly, so I’ll just start right now with the ones I have done, and a separate post on a few other subjects. 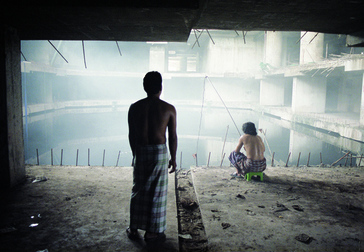 This one might be strictly for the Tsai Ming-liang fanboys — but I am one, so bear with me. The typical Tsai scene, for those unfamiliar with his work, is of a single shot with the camera at rest and just looking for a very long time, on average more than a minute, I’d guess. Rarely do the characters even speak (I counted fewer than 15 lines from all the characters of GOOD BYE DRAGON INN). 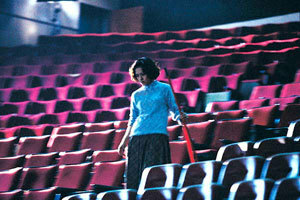 GOOD BYE DRAGON INN takes place in a movie palace that seats about 1,000 people, but has only three or four in it, watching the 1960s Chinese martial arts classic DRAGON INN. And they get on each other’s nerves in the most unexpected ways. His characters are mostly alienated from the world and each other, and Tsai’s framing traps them in social space. His minimalist style makes every tiny gesture and sound effect take on enormous significance. Tsai makes us just *look* at the world for the sake of seeing, and he is so good at playing with our expectations of screen space that he makes us aware that we are looking. GOOD BYE, DRAGON INN was really pretty funny, which is what makes it worth seeing and what separates Tsai for practitioners of this “master shot” style, most of whom I can’t abide. He has a very precise and apropos sense of humor — dry, wry, understated, self-aware. Both this film and WHAT TIME IS IT THERE have some of the qualities of Steven Wright’s comedy routines. They’re both so understated that the understatement eventually becomes part of the joke. There’s one shot involving three people at a urinal that goes on and on and on for so long that you start to laugh because you start having subversive thoughts like “how big ARE the drinks in Taiwanese theaters.” Dramatically speaking, the scene goes on for far too long, and that’s [part of] what’s funny about it. This film is even funny where there are no punch lines — you know you’re in the hands of a genius when you look at a burning cigarette for two minutes, waiting for the ash to hit its mark. What I thought was the last shot (it lasts about eight minutes and nothing happens in it) is such a sad lament that it brought a lump to my throat — it has the poignance of a man imagining his own funeral (and Tsai is barely 45). GOOD BYE DRAGON INN is definitely slow-moving and not to every taste, and it probably isn’t the best place to start an inquiry into Tsai’s ouevre (too many of the laughs are self-parodying in-jokes that depend on at least general knowledge of his other films). Tsai is definitely a taste worth acquiring, but I’d recommend starting with THE HOLE, in which his style is applied to … a musical. This could have been the MIRACLE IN MILAN of the Iranian flavor of neorealist social protest films. 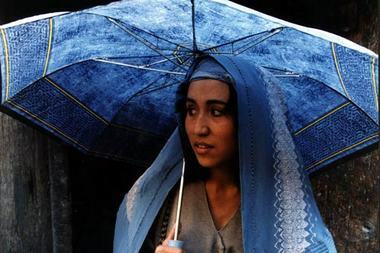 Like MIRACLE (my favorite of Vittorio De Sica’s films) it had a comic-absurd premise — in this case about a young Afghan woman who secretly goes to school, against her traditionalist father’s wishes, and decides to run for president of her country now that the Taliban is gone. It could have made a subtle, pungent fable about the state of women under Islam, especially if flavored with the magic realism of which De Sica’s film was a precursor. Actually, Miss Makhmalbaf’s mother Marziyeh Meshkini already has made such a film — a trio of featurettes called THE DAY I BECAME A WOMAN. Instead, FIVE IN THE AFTERNOON stays with the style of simple miserabilism, while plotwise just blurting off in various directions — a boy courts her, there are other girls at the school and they debate liberal feminism vs. deifference feminism, she tries to get her photo taken for her presidential campaign, refugee families feud over chickens and radio volumes, she meets a French soldier, she changes shoes, her father doesn’t want to return to Kabul because it’s a den of sin, more refugees arrive. It contains a lot of things, but never really succeeds in being about any of them. The basic premise about running for president is so outlandish that the film needed to be tightly-wound and focused to work as an comic fable, like Miss Makhmalbaf’s segment in the September 11 omnibus movie, about a teacher trying to explain the terrorist attacks to some Afghan refugee children in Iran. Instead FIVE IN THE AFTERNOON feels more like a rambling, rough draft of a film than a film. The film has one other problem — but it’s a major one, and one that may ruin good memories of other Iranian films. For more than a decade now, The Charter Member Of The Axis Of Evil has had one of the world’s most internationally-respected and artistically-successful film industries. Quite a few of its prize-winning films, just like AFTERNOON, featured nonprofessional actors and impoverished backgrounds — A TIME FOR DRUNKEN HORSES, KANDAHAR, THE WIND WILL CARRY US, CHILDREN OF HEAVEN, and such early Abbas Kiarostami films as WHERE IS MY FRIEND’S HOME. But AFTERNOON was the first film for which I felt a qualm others have had before, and that is that most of the acting is quite bad. In fact, sometimes painfully bad. I repeatedly noticed the lines were written/delivered in an overly repetitive, overexplanatory style (a sample from the father: “Bin Laden should not be sent to the infidels because they will kill him. Because he is a Muslim, he is our guest. So he should not be turned over to the American infidels to be killed.”) And I could “see” the actors “acting” and in an extremely stilted, mannered way, as though they were reciting written speeches to the camera. This would be unfortunate enough in itself if it were just AFTERNOON, but this is a complaint that others have had about some of these Iranian movies, but which only occurred to me at certain sequences in KANDAHAR — the several scenes in that earlier film that were in English. Not being able to speak a language (as I do not Afghan or Farsi) hampers your ability to tell whether someone is delivering his lines convincingly — it’s all just sounds with a subtitle. After AFTERNOON though, I’m now afraid to give another look to some of these earlier Iranian movies, several of which resemble AFTERNOON in the ways noted, but which have been prominent in and around my Year-End Top 10s. Ignorance may have been bliss. Jack Black plays a broke schlub who’s been kicked out of his rock band. So when he answers a call from a rich-kid school intended for his substitute-teacher roommate, he decides to muscle in on the well-paying gig, even though he can’t teach and knows nothing. But with his attitude and the energy of rock, by the end of the movie, his class is a hit at a local Battle of the Bands, he’s won over the teachers and the kids’ parents. This movie is really stupid, since this scam wouldn’t last five minutes. (Don’t posh schools ask for credentials or at least check IDs?) SCHOOL OF ROCK takes place in that alternate universe where Battle of the Bands contests take place during weekday school hours and it takes just five minutes to change from school uniform into rock band costume. Not a single plot event is believable (he wins over the teachers with the Whitney Houston philosophy of education — “I believe the children are our future,” etc. ), and it has a really distasteful subtext about how stupid is academic success and how you gotta be pissed off at the world (check out Theo on this point). I also had to watch it sitting next to this grown man with a 2-year-old son sobbing like a little girl throughout. I enjoyed this film immensely. Just speaking personally in the context of seeing SCHOOL OF ROCK at a festival, if you’re gonna see 40 films in 9 days, you’ll go insane without a couple of breaks with 100 minutes of Hollywood brain-candy. While it’s clearly obeying the same feel-good rock movie formula as, for example Justine Bateman’s SATISFACTION, SCHOOL OF ROCK uses that formula as well as it can be used. The high-achieving kids whom Black’s character melds into a rock band give uniformly excellent performances without one of them ever being showy, and Joan Cusack is not completely wasted in the school-principal role, usually a black hole in movies not named FERRIS BUELLER’S DAY OFF (all hail director Richard Linklater). 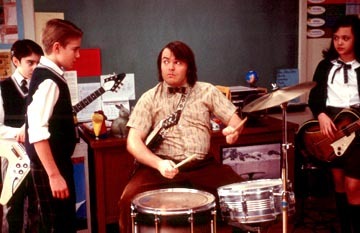 But SCHOOL OF ROCK is basically “The Jack Black Show” and he, or at least his comic persona, was born for this role. Showily rude but at heart a coward, infantile, self-centered, hyper-knowledgeable about one thing in life (rock music, in this case), he’s playing the Gen-X uber-slacker that he defined in HIGH FIDELITY. While SCHOOL OF ROCK is not aiming for the throat — it’s too much a commercial feel-good film for that — it’s more critical of Black than we might expect. For example, consider one of the biggest laugh lines — “Sell my guitars,” he says, all indignant. “I’m an artist. Would you tell Picasso to sell his guitars?” Part of the joke is the absurd self-regard of comparing himself to Pablo Picasso (and we’ve seen him perform, so we know he doesn’t even compare to Pablo Cruise), but part of it is also that he doesn’t seem to know Picasso was a painter — he’s just “Famous Artist” for Black to name-drop. But then compare that to the fanatically detailed curriculum on the history of rock of which we get an glance, albeit unfortunately brief. Speaking as someone more or less Black’s age who remembers most of the plots from “The Jeffersons” and has favorite seasons depending on cast members and character trajectories (it jumped the shark when George and Tom became buddies, BTW) … ouch.